QuickOffice HD Pro (iPad only version, separate version for the iPhone) is one of the two apps we use to create and edit Microsoft documents. It creates documents as well as edits ones you have created on your desktop. As well, you can move the files around through a variety of cloud services. On the Evernote site this week, there was a mention of new functionality in QuickOffice HD Pro, bringing the two together. 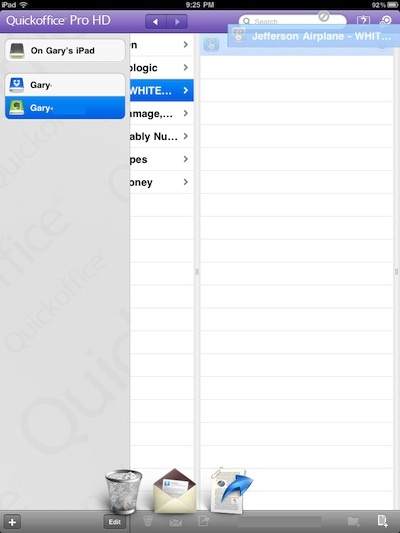 Cool integration between Evernote and Quickoffice Pro HD, a mobile office solution for your iPad. 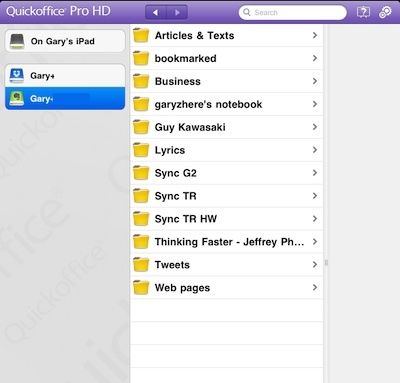 When you connect Quickoffice Pro HD on your iPad to your Evernote account, you’ll be able to open any Office file contained in your Evernote account, make whatever changes you want, then save the updated version back into Evernote. This partnership is all the more useful now that we’ve removed our free user file type restrictions. Adding Evernote to your list of Cloud location in QuickOffice Pro is just like the rest, use the ‘+’ button. 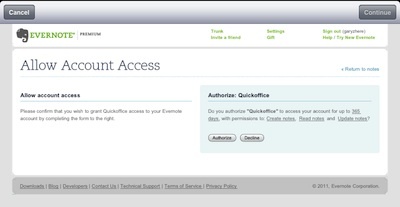 Evernote will require you to sign into your account and OK QuickOffice HD Pro to show and download/upload your documents. All of the folders in your Evernote account are shown by selecting the new Evernote Cloud option from the QuickOffice Pro list. Tap a folder to see all of the documents within that folder from Evernote. Documents in folders as seen on Evernote desktop app shows as a folder in QuickOffice so that multiple versions of the document can be represented. 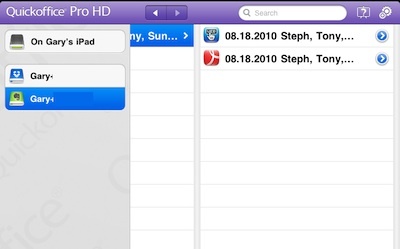 Sweeping your finger across the screen is supported to go back up a level of folders. The ‘folder’ contains all of the versions of the document that Evernote has. In this case, we have multiple versions due to the recently updated desktop Evernote’s conversions of documents when edited. Below QuickOffice HD Pro shows the documents available as HTML and PDF. Tap a document to see the specifics that Evernote knows about it. All of the documents we created in Evernote directly showed in the ‘info’ area as HTML text. 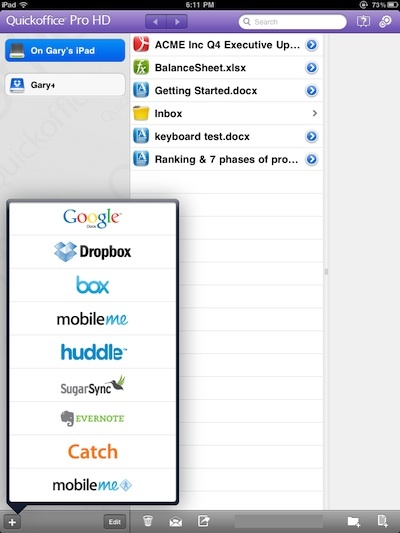 Tapping a document will download it from Evernote to your iPad within QuickOffice. 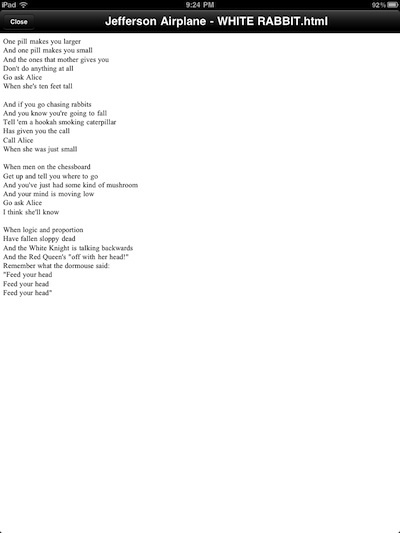 The document is downloaded to your iPad to view. Text documents as simple text and PDFs exactly as they appear elsewhere. Now, this is where it all fell apart for us… six out of six of us was unable to edit the document as the Evernote site had stated we would be able to. Is this due to a limitation of QuickOffice HD Pro or is Evernote not passing all the document info needed… we will keep an eye on this and let you know if we find any answers. Tap and hold on a document to activate the options at the bottom of the screen. Drag the document down to one of the three; Trash, Cloud Storage Options and to attach to an email.